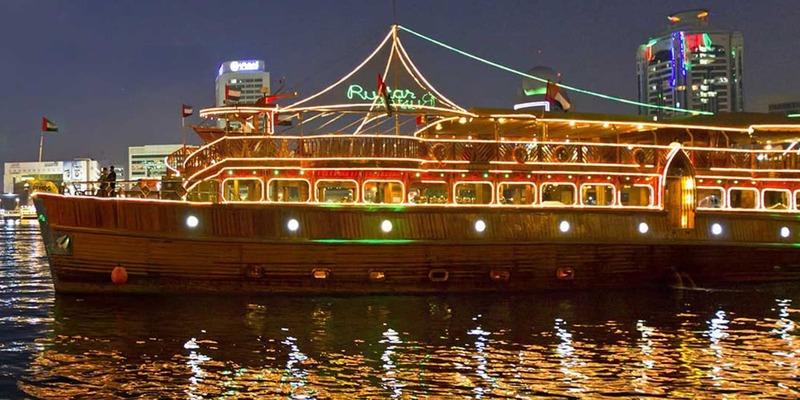 We welcome you on board the world’s biggest Dhow Cruise Dinner in 5 Star Rustar floating restaurant to experience a romantic cruise with some of the best international cuisines. The boat has all the luxuries of a 5-Star restaurant with an added beauty of the traditional human touch that our artists have intricately hand-sculpted on this specially-designed teak wood vessel. Night and peace are the words which can be taken for the same meaning because nights are mad for peace and just think if your night which is already known for peace is spent near the river, will you be able to calculate the amount of peace and calmness you will get there? No of course. 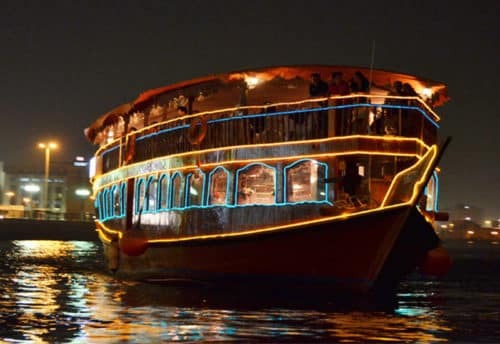 Cruise Dinners are also a thing which is very popular for calming people and relaxing them like Dhow Cruise dinner in Dubai is an unforgettable experience, whereas cruising down the creek within the heart of port is a tremendous sight and skill. 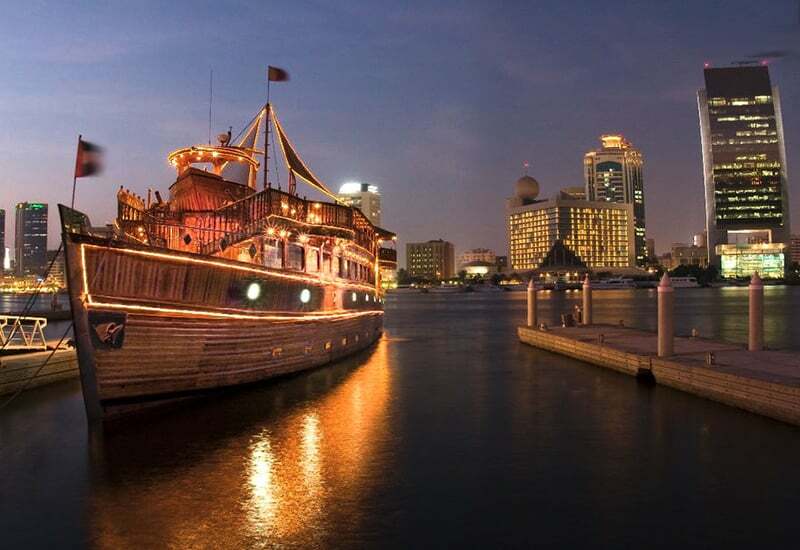 Step aboard a standard picket sailing ship Cruise to experience real Arabic and continental Buffet in a restful atmosphere with soothing background music. Wonderful is a very small word to explain how the experience is. Taking you into imaginations is the only option left for explaining to you how the experience is. 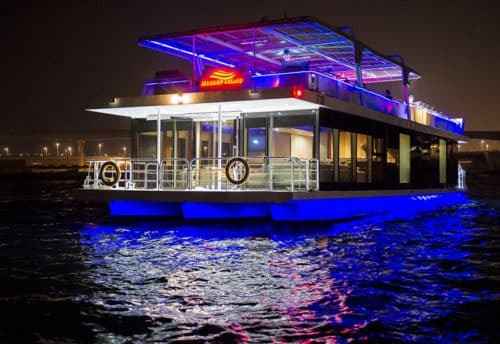 Okay, so imagine you are sitting on a wooden boat all decorated with bright lights some of the white color, some of golden, some of the yellow and many more colors and that boat is in the middle of a river. Everything around you is very calm, all you can hear is the sound of beautiful music that is being played around you and of the waves of the river. You are away from the city noises and road traffic. And among all this beautiful view you are being served with food which is super amazing and palatable in its taste. If I will tell you more of this experience you will think that I am lying because all of this sounds so dreamy and much far from reality. 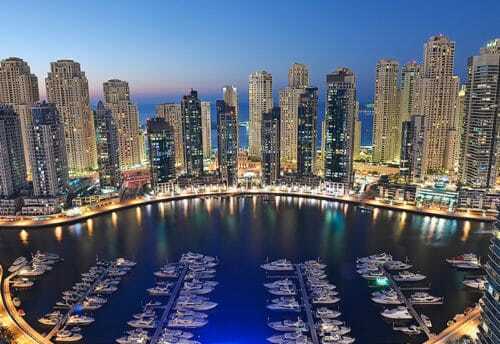 So to believe me that all of this is the reality you have to visit it as soon as you can! Our service starts with a pickup facility from your mentioned pickup point somewhat around 8 pm. Your welcome at the cruise dinner will be done with the drinks. After that, the cruise will be started. The duration will be of 2 hours. The boat will move up and down slowly on the river. You will be able to feel the movement of waves. 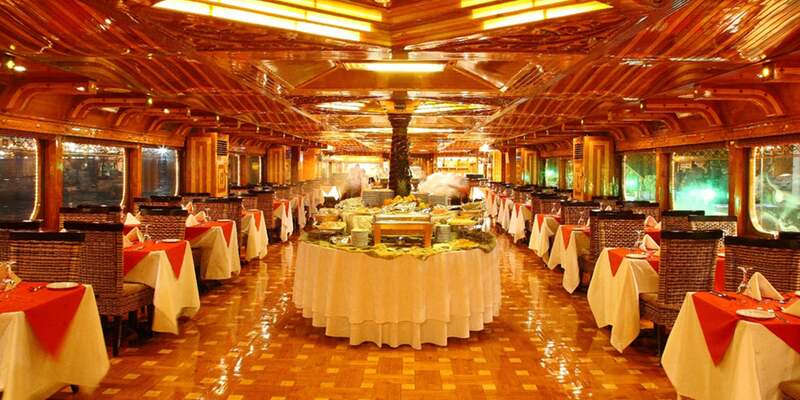 A number of food items will be served during the cruise and of course, the buffet dinner will also be served. That food item includes fresh Arabic coffee and drinks first and after that with a wide variety of gourmet cuisines which can also be called as its specialty.